CEO Sergio Marchionne wore a tie for Friday's event. 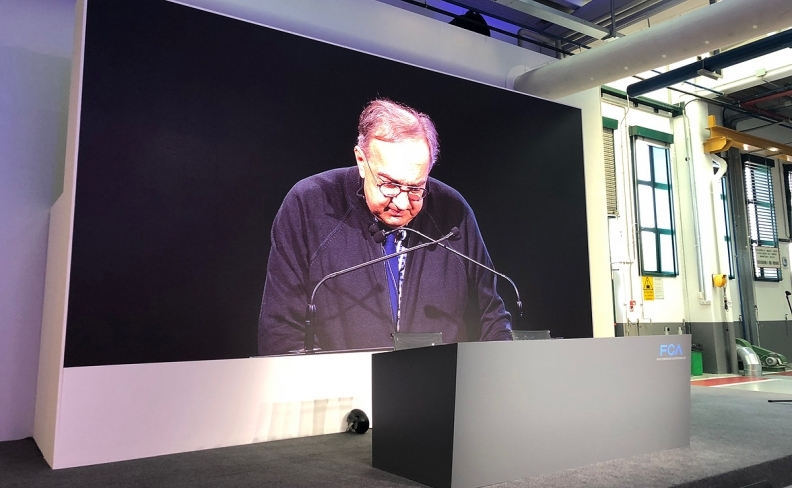 BALOCCO, Italy — In his last big presentation as CEO of Fiat Chrysler Automobiles before retiring, Sergio Marchionne announced a big investment push to make more electrified cars, while acknowledging that traditional engines will continue to dominate production for some time. Unveiling the company's plans through 2022, Marchionne said Fiat Chrysler will invest 9 billion euros (US$10.5 billion) as it tries to catch up in the market for gas-electric hybrids and fully-electric vehicles, without forsaking a core market that still wants internal combustion engines. "At FCA, we believe there is no single solution, no magic formula, to solve this problem. We believe to achieve a quantum leap, the entire system — political, economic and industrial — needs to work together together with the right measure of realism based on finding the appropriate balance between consumption levels, cost and efficiency. "At the same time, conventional internal combustion engines will continue to be in the vast majority of our productions." The daylong presentation focused on plans for the brands that drive revenues: Jeep SUVs, Ram trucks and premium brands Maserati and Alfa Romeo. CFO Richard Palmer said by 2022 those brands with Fiat Professional would represent 80 per cent of revenues, compared with 65 per cent today. Palmer said Fiat expected to recover 65 per cent of electrification costs through higher prices, while 15 per cent of capital expenditures of 45 billion euros in the period would be invested in conventional engine technology. Notably absent were the marquee brands: Fiat, Chrysler and Dodge, which both represent the less-profitable passenger cars currently off consumers' radar, particularly in the United States, where Fiat Chrysler makes more most of its profits, but also in fast-growing China. The long-term fates of those mass-market brands remained unresolved, with no specific product presentations offered. A company spokeswoman said Thursday that those brands would not be fully eliminated. Maserati plans to add 32 dealerships in North America by 2022, and will aim squarely at Tesla with a new high-performance plug-in electric hybrid sport coupe based on the Alfieri concept, new brand head Tim Kuniskis said. The brand will move from 153 to 185 dealerships in North America by 2022 as part of an ambitious plan to double worldwide volume in that timeframe with a new lineup, he said. The all-wheel-drive EV will come in a droptop model as well and will feature an aluminum frame for weight savings, with a top speed above 186 mph. It will replace the GranTurismo in Maserati’s lineup. Maserati will also launch a new midsize crossover plug-in hybrid by 2022, slotting below the Levante, Kuniskis said. Kuniskis, the former head of Dodge, said the new crossover would feature 50/50 weight distribution and a best-in-class power-to-weight ratio to boost its performance against competitors in the crowded segment. The same attributes will be imbued into new planned versions of the Levante and Quattroporte, which are planned to appear in the next four years. The 65-year-old Italian-Canadian has said his successor as CEO will come from within the company. In a break from fashion tradition, Marchionne unzipped a knit cardigan to reveal a blue tie — the first, he said, he has worn in a decade. It is a gesture he had promised if Fiat eliminated debt, which he said will happen by the end of the month. Marchionne is famous for unfailingly wearing navy blue cashmere sweaters and never a tie, no matter the event. Jeep brand chief Mike Manley did not provide a future target for sales, which are currently around 1.9 million vehicles a year. But he said that now one in every 17 utility vehicles sold in the world is a Jeep and he expects that to be one in 12 by 2022. Meanwhile, the premium brand Alfa Romeo plans to increase annual sales to 400,000 by 2022, having missed a goal this year. Kunsiskis said the brand aims to compete with Tesla with an all-electric supercar named "Alfieri" that will accelerate from 0-100 kilometres (0-60 miles) an hour in around two seconds. The brand forecasts sales will double from last year to 100,000 cars a year by 2022. Larry Vellequette of Automotive News contributed to this report.